Although the artwork is quite bland, I had to include this one. 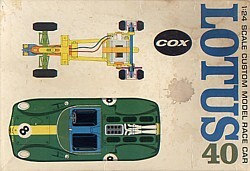 It is the first Cox box in the Boxart pages. 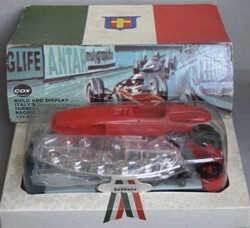 A very famous series of 1/32nd kits, in many ways the follow up to the great Revell 1950s kits. IMC did a great job, nice cars, nice kits (and slot versions as well), great artwork. Very similar artwork to the Ford. Sadly all of those are rare and expensive. 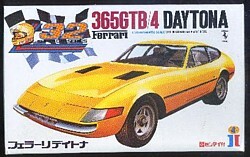 Here is a really really rare kit, a 1/32nd Ferrari Daytona!!!!!!!!! Long before Mr Fly though of it, Ikko of Japan released it. Incredibly, it is more accurate than the Fly model which a great disappointment.